The writing was rather mundane and treated the reader as rather simple; struggled to read it. Improved by part three; the ending was worth the commitment of persisting until the end. Possibly it would appeal to readers who like a predictable book to read, though the ending was totally unpredictable. The subject matter – families and domestic life was not a bad topic, but the group felt the writing was boring. The family theme and the focus on the sons typical of real families, but the book itself was too long. Having four generations in the book did make it too long but a story involving an extended family the house was good. The shifts in time were interesting. I actually didn’t mind the first section of the book and actually thought I might enjoy this one but then it became tedious and I agree with John overly descriptive which was very irritating. Maybe it is not a bloke thing as John thought because I find it unnatural and unnecessary to add all that fluff and it takes away from the flow of the story. Although I couldn’t get interested in the story either and I only got half way. It seemed to be going nowhere and I couldn’t get through any more of it. My mind wandered to more interesting things and I found myself rereading and rereading pages as I struggled to keep interested. In brief, I absolutely hated the first 250 pages or so – but when we started to learn about Linnie May and Junior it started to interest me. In fact, part 3 actually grabbed me. I think it’s a bloke thing – I found she spent far too much time describing things like clothes and food. The only person I really liked was Abby: at least she had a soul. 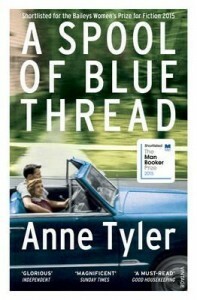 This entry was posted in Book Club Kits, Book Reviews, Fiction and tagged a spool of blue thread, anne tyler, First Wednesday Book Group, Parramatta Library by admin. Bookmark the permalink.